I am feeling much better this evening so I wanted go ahead with another "Thrifty Thursday". I am absolutely stoked (yes, I said stoked) about this week because I am actually prepared for this post. So, "what are we thrifting," you ask. Well...Picture frames. There are so many things that you can do with a picture frame. 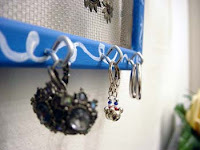 I made a cool earring organizer. 1. Making a serving tray by adding handles and a nice image. The image can be interchanged for themes, seasons, holidays, etc. 2. As suggested in this book, you can use a large, empty picture frame to display bulky and decorative items. The author uses one to display her collection of teacups and changes these out per the season. 3. Place mirrors in several picture frames and make a mosaic of them on the wall or use a large one to accent around a light in the ceiling as suggested in this blog post. 4. Make a coaster out of a small frame or use one of the other suggestions on this earth friendly site. 5. Even Real Simple has the great idea to make a fridge magnet along with a few other great picture frame uses. Re-do an old, ugly frame by painting/white washing, staining, gold/silver leafing to just your style. Write/ type up an inspirational or funny quote and frame it. Place some money or a gift card in a small frame as a new way to present a gift. This makes it two gifts in one, which is even nicer. Picture frames are often easy to find in thrift and discount stores. You probably have a few even sitting around your house that you don't use. Go get one or eighteen and make something spectacular with them.